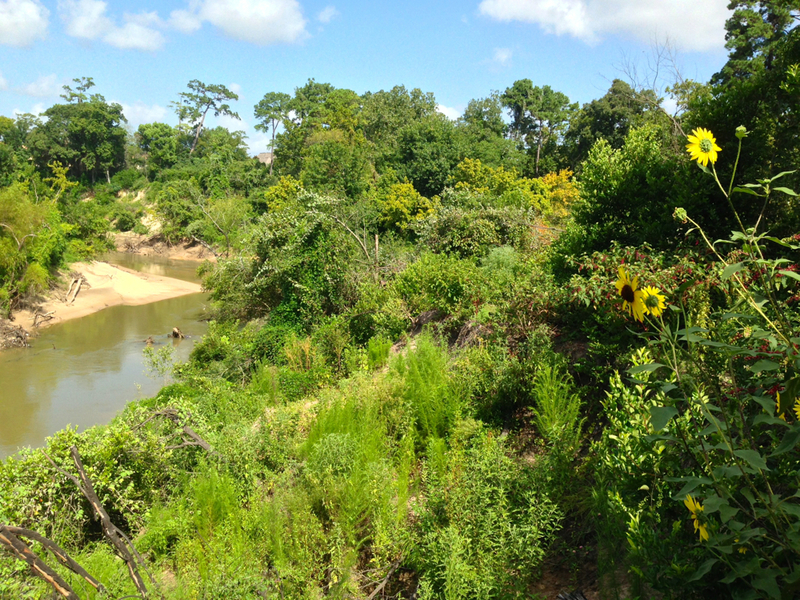 In case you missed Jim Olive‘s summer shot of that Bend in the River, here is the latest addition to our series of photographs taken from the same high bank on the north side of Buffalo Bayou in Memorial Park. The view has changed over the course of four years. In particular, since the high waters of Harvey, the bayou widened to accommodate the massive flow. Banks slid or slumped away, as they will do on the bayou when water rises over the banks and onto the natural floodplains. Trees and vegetation slide down too. Ideally this woody debris, often still living, should be left in place to collect sediment, reinforce the banks, and facilitate regrowth and rebuilding of the banks. It’s a cycle that has been continuing on rivers for millions of years. Unfortunately, the Harris County Flood Control District hired contractors and paid them by the pound to collect as much of the fallen vegetation as possible. Summer sunrise on Buffalo Bayou. That bend in the bayou on July 1, 2018, with flow at about 280 cubic feet per second. Photo by Jim Olive, of course. 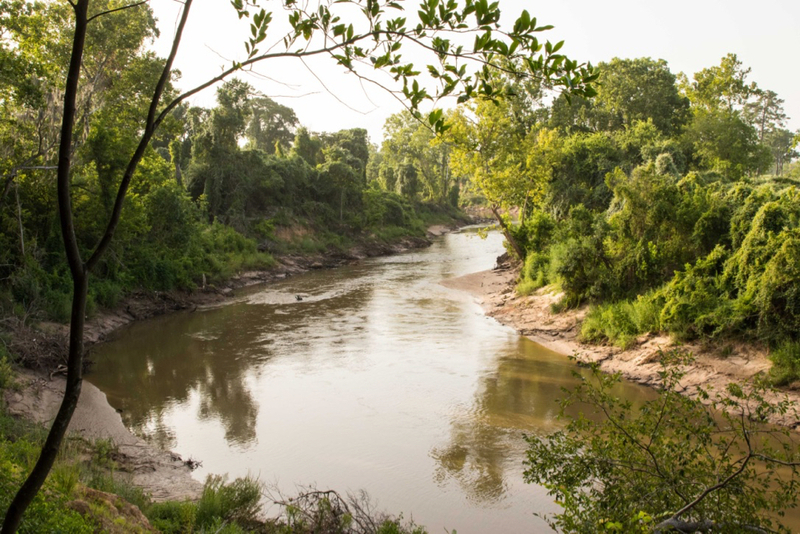 Known as Houston’s Mother Bayou, in large part because most other bayous and streams flow into it, Buffalo Bayou is some 18,000 years old, more or less, and one of the few natural waterways in the city that remains largely unchannelized. The beauty of it flowing past Memorial Park is that this forested stretch is one of the last accessible to the public. It’s a historic nature area, ever changing and adapting, filled with ancient high banks and sandstone, beaver, otter, massive turtles and other wildlife. 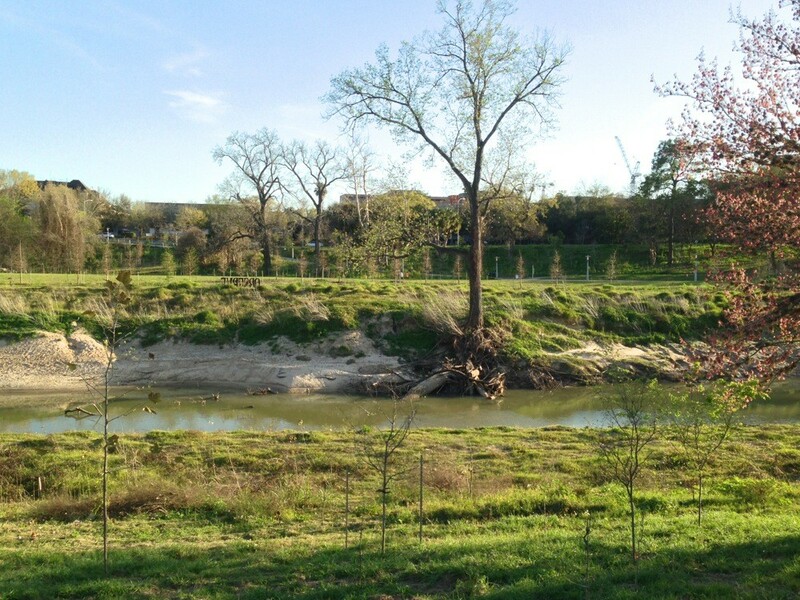 Though in the wake of Harvey there are calls to “improve” our bayous, including Buffalo Bayou, by widening and deepening, even straightening, the fact is that meandering streams carry more water — because they are longer. Artificially widening and deepening streams doesn’t last: the banks collapse and the channel fills with sediment. Rivers are living, dynamic systems and will adjust to stabilize themselves. The trees and vegetation on the banks help absorb and cleanse stormwaters and prevent flooding by slowing and diffusing the energy of the stream. Our political and civic leaders should focus on slowing the flow with green spaces, prairie and wetlands, swales and rain gardens — stopping, spreading, and soaking up stormwater before it floods our natural and built drainage systems. 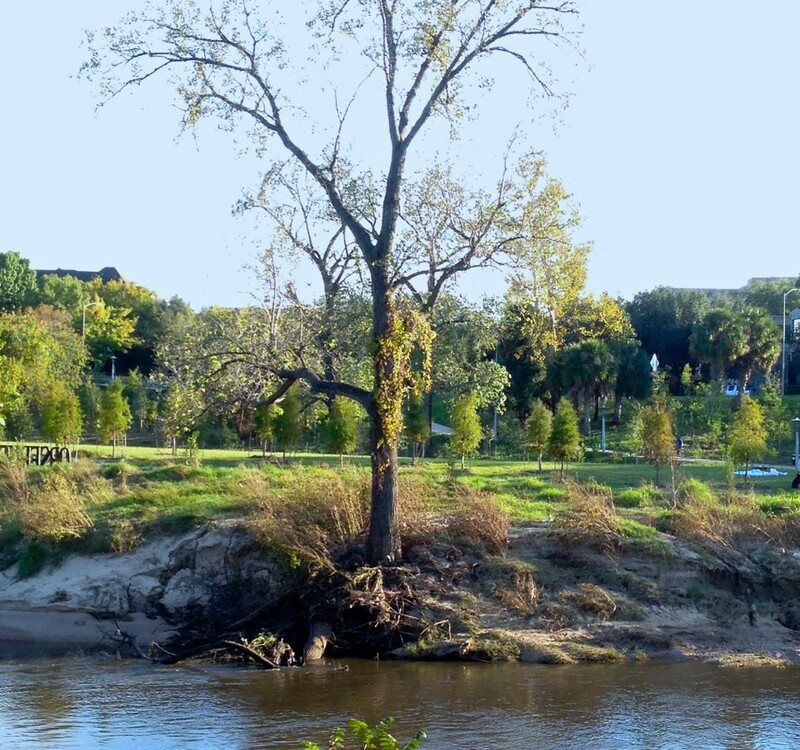 Outstanding sycamore on the south bank of Buffalo Bayou upstream from that Bend in the River that we have been documenting for four years now. Photo by Jim Olive on July 1, 2018. A big pine standing on the high bank of Buffalo Bayou in Memorial Park. Asking for a hug. Watch this video of a summer sunrise on Buffalo Bayou in Memorial Park, July 1, 2018. Riding a bike along the edge of a cliff above a river is bad enough. Even walking on top of a high bank can be damaging. 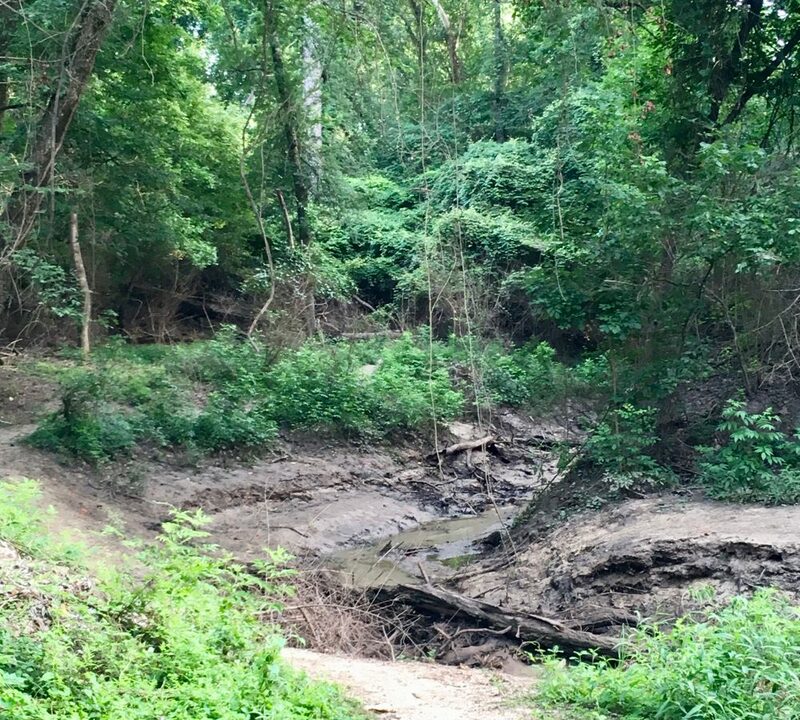 But the high banks of Buffalo Bayou in Houston’s Memorial Park are already stressed and attempting to recover from the overbank flooding that came with Harvey last summer. Large sections of the bank slid away, taking down trees and vegetation. 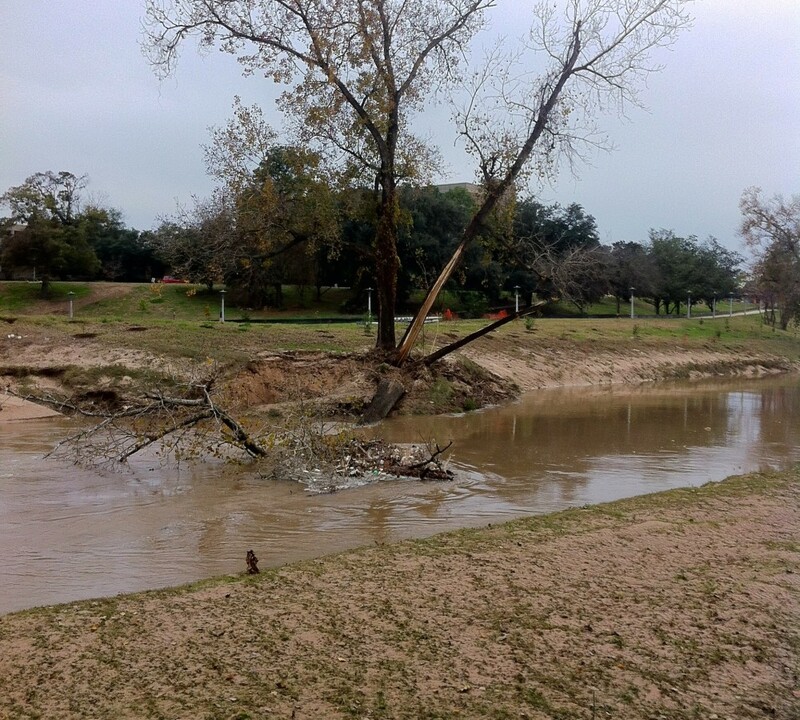 With time, however, the vegetation will grow back, the downed trees will collect sediment, and the banks will rebuild. Now that recovery will be much more difficult. In the past weeks, off-road cyclists built a bike jump and wooden ramp right at the very edge of the bank near the main tributary draining the center of the park. 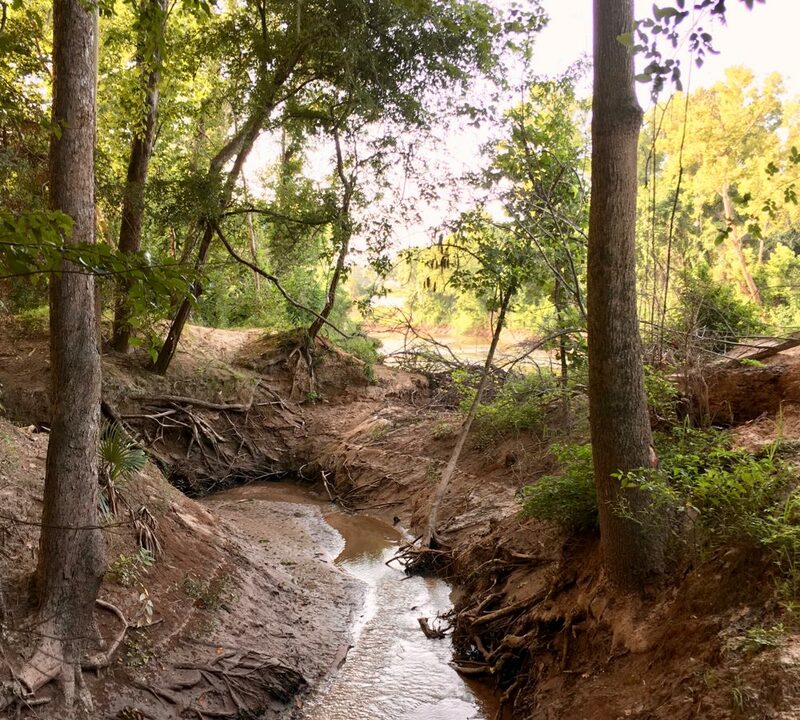 This is very near the Bend in the River that Save Buffalo Bayou and photographer Jim Olive have been documenting through the seasons for the past four years. The culprits apparently removed vegetation, dug holes, and drove large boards into ground. And then, of course, they’ve been pounding the edge of the bank with their bikes. They also dug up dirt to mound it into a jump further down the bank. 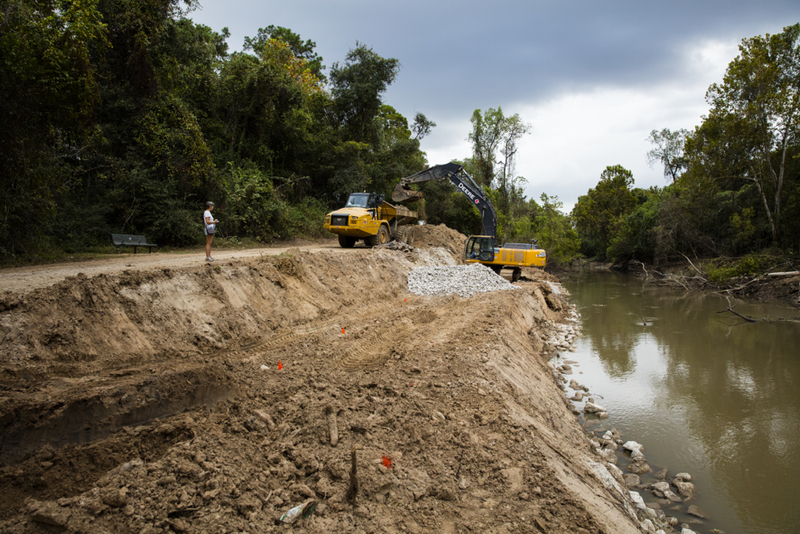 Representatives of the Greater Houston Off-Road Biking Association (GHORBA) condemned the construction. “Most likely it is from a mountain biker that isn’t associated with GHORBA, as our trail stewards must approve features before they are built and this one, to my knowledge, was not,” wrote Christy Jones, president of GHORBA, in an email. 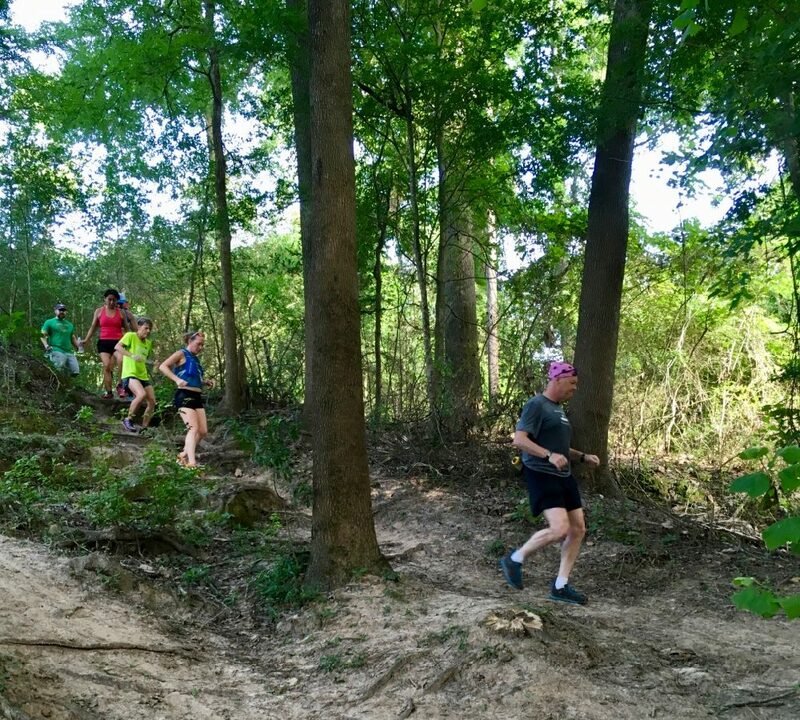 The dirt paths through the woods along Buffalo Bayou south of the Picnic Loop in Memorial Park are unofficial trails. However, they are much used by walkers and runners. Other trails in the park are officially open to bike riders as well as others. The neighboring Arboretum, however, does not allow bikers on its paths. In the meantime, some more positive news: members of Boy Scout Troop 55 are doing good deeds again. This time, under the leadership of Boy Scout Austen Furse, who developed the plan for his Eagle Scout project, they planted 200 buckets of native eastern gamagrass on the upper banks of the ugly stormwater outfall, formerly a nature trail, also known as the Woodway Boat Launch, in the Old Archery Range of Memorial Park west of Loop 610. This happened Saturday morning, March 3. Eastern gamagrass is an herbaceous stabilizer plant, described as “riparian rebar” and a “big, green leafy cousin of corn.” Though slow to establish, once established, eastern gamagrass can grow to six feet or more and has “extremely good root stability,” according to Your Remarkable Riparian, a field guide to riparian plants found in Texas. Take note, property owners contemplating ugly and damaging concrete riprap for bayou banks. Let’s hope the young gamagrass doesn’t get mowed down. Austen is planning to photograph the site every week or two to document the results, says his mother, Anne Furse. From a distance you could hear the monstrous roar of the heavy equipment in the woods. Following deep, wide tracks smashed into the bare dirt along the bank of Buffalo Bayou, passing large cottonwoods apparently cut to make way for the big equipment, we came across a scene of troubling destruction. A gigantic articulated 30-ton dump truck with six massive wheels was slowly rolling towards us with a large load of fresh dirt and dripping mud dug up from the bayou bank. Further along a 60-ton excavator on tracks sat on the very edge of the bank, expertly swiveling back and forth, scraping up the dirt bank and dumping it into the truck, scooping up loads of white limestone rock and dropping it in a layer where the excavated bank once was. We’d seen the eroded bank before the “repairs” began. This damage was far worse. The year was 1933. Frank Smith was twelve years old and he had just climbed to the 14,255-foot summit of Long’s Peak while at Camp Audubon in Colorado. It’s an achievement that still makes him proud. But more importantly, being in the snow-capped Colorado mountains changed the perspective of a young boy born and raised in a flat, humid city, albeit in one of the leafiest, most privileged neighborhoods in Houston. Those fortunate summers in the Rocky Mountain high forest wilderness during the Great Depression set Smith on a remarkable path of conservation and environmentalism. He read the books of John Muir, founder of the Sierra Club in 1892, including The Mountains of California. 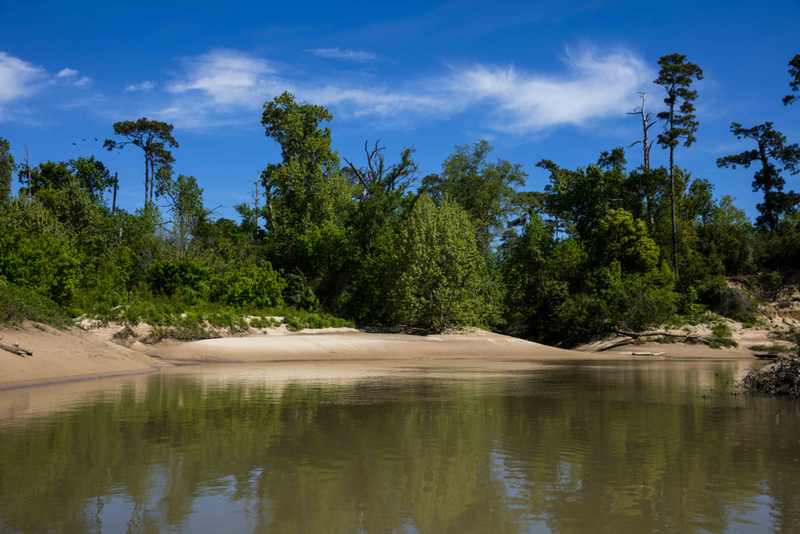 That path would lead Smith to found and lead numerous organizations, most recently Save Buffalo Bayou, that have helped protect and preserve bayous and streams, including Buffalo and Armand bayous, Galveston Bay and its estuaries, and create public park lands around the state of Texas. 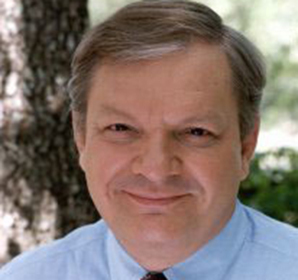 He would work with virtually all of the region’s prominent conservationists, all of them becoming close personal friends. Some of them had been friends since childhood. But first he would have to grow up, join the Navy, establish several engineering businesses, invent some things, and meet Terry Hershey. 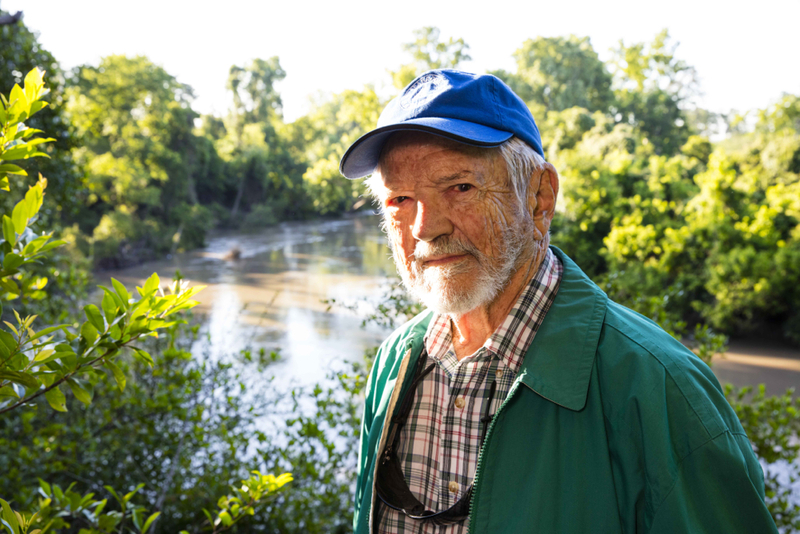 Frank C. Smith Jr., founding president of the board, Save Buffalo Bayou, in Memorial Park on a high bank above Buffalo Bayou. Photo taken May 5, 2016, by Jim Olive. Boy Scout Paul Hung rallied his troop for the third floating inventory of the banks of Buffalo Bayou on a recent Saturday morning. 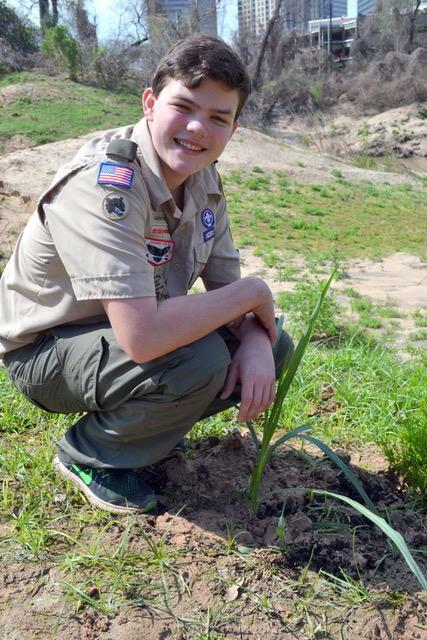 Hung is documenting the tracks of wildlife as an Eagle Scout service project, and his fellow scouts in Sam Houston Council Troop 55 are helping. 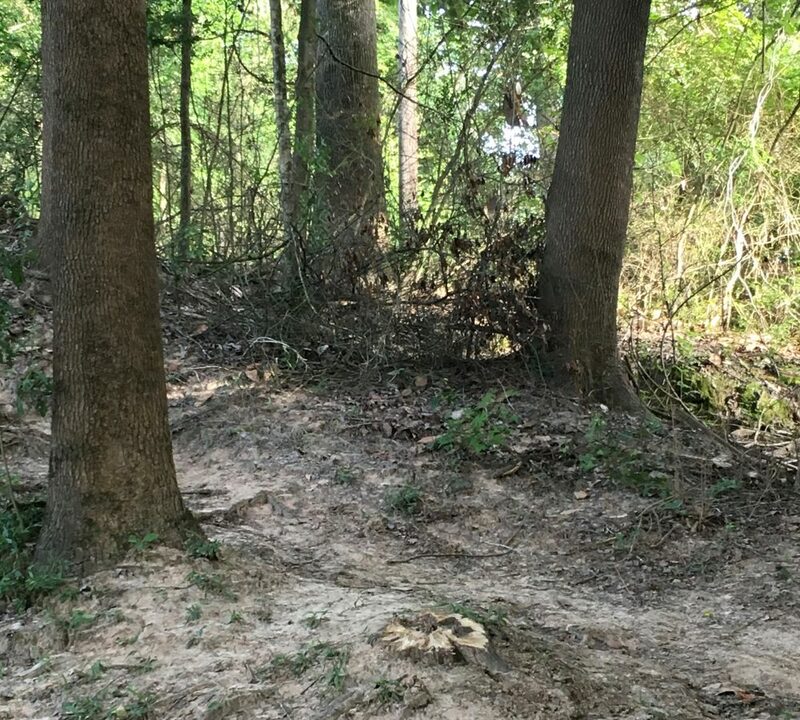 Hung and other scouts have so far found over 130 tracks of animals including raccoon, beaver, possum, coyote, grey fox, bobcat, great blue heron, egret, otter, nutria, wild boar, and others. The tracks are being plotted on a map, and the information will be published as a pamphlet with the help of Save Buffalo Bayou, which is the beneficiary of the project. Anyone who wishes to donate to help Paul Hung publish his Buffalo Bayou wildlife pamphlet can do so here. About a dozen Boy Scouts and adult observers gathered with their Boy Scout wooden canoes at the Memorial Park boat launch at Woodway Sept. 10. It was a steamy morning, and they planned to paddle past Memorial Park and the Hogg Bird Sanctuary all the way to Lost Lake in Buffalo Bayou Park. Hung handed out clipboards and gave instructions for identifying and photographing the tracks and recording their location using a compass app on a cell phone. 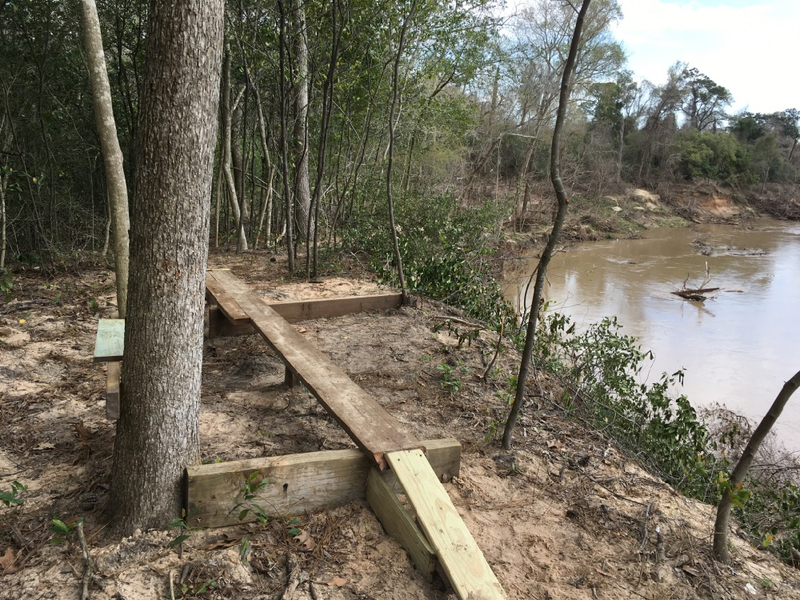 Nearby was the wooden box, built and recently installed by Troop 55 Boy Scout Saswat Pati, containing reusable bags for picking up trash on the bayou. Does It Make Sense to Repair? 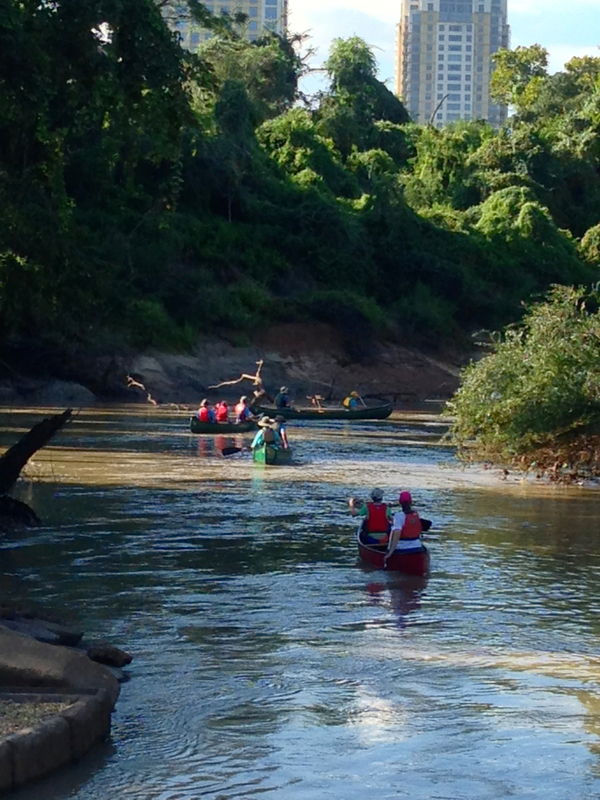 We finally had a chance recently to float down beautiful Buffalo Bayou to see how things have changed. Our trip took us past Memorial Park in the middle of Houston. We also biked along the bayou through Terry Hershey Park far upstream in west Houston below the dams to see what was happening there. The good news is that some of the high banks that had slumped in Memorial Park and the Hogg Bird Sanctuary during the Memorial Day 2015 flooding are naturally rebuilding. The bad news is that the River Oaks Country Club has added more riprap to the south bank, hard armoring the bank with ugly, damaging concrete rubble, including where it should not be. Nature’s Miraculous Way of Restoring. For Free. Houston has had multiple record-breaking rains and flooding since the spring of 2015. 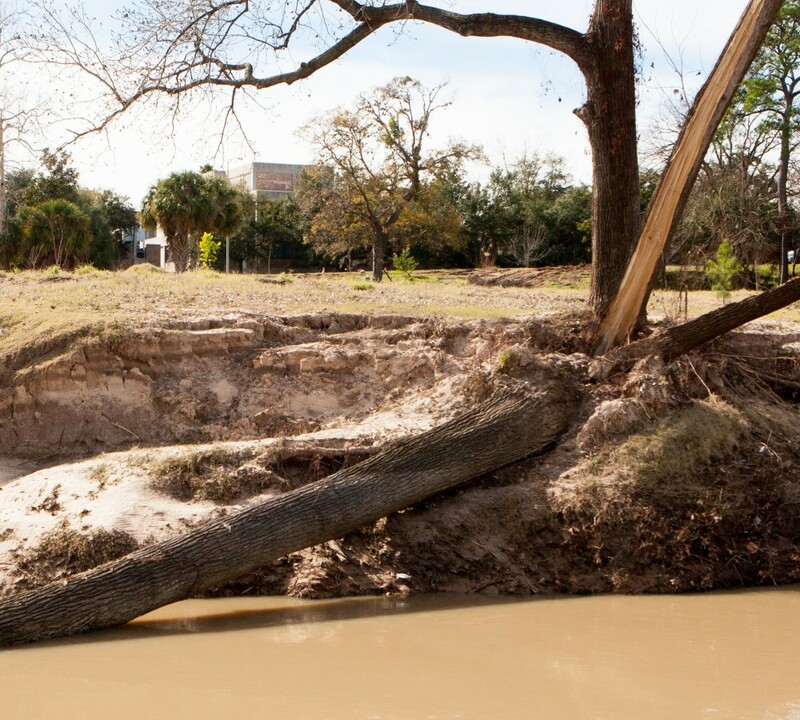 When Buffalo Bayou overflows its high banks, as it did in the Memorial Day flood of 2015, the banks in places sometimes slump or slide away. This happens when the overflowing water seeps through the ground and saturates layers of sandy clay that liquefy, sometimes causing the bank to give way. 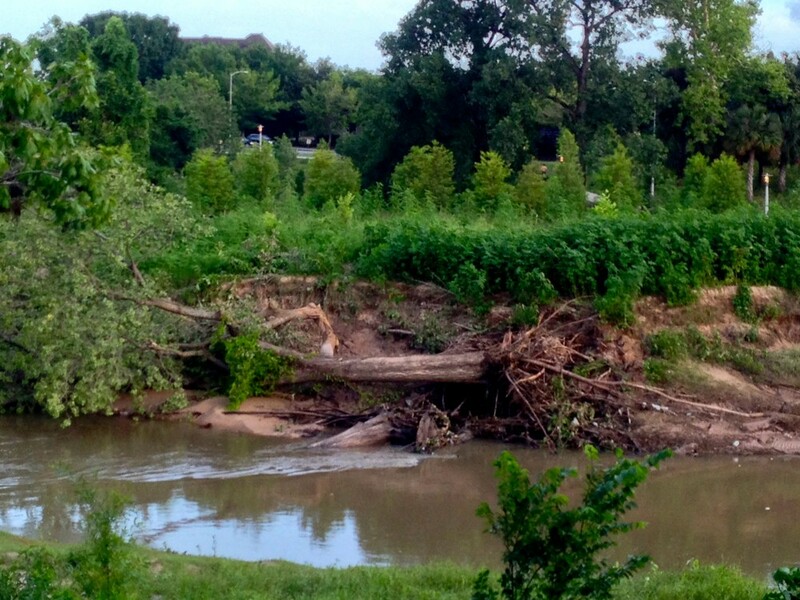 Buffalo Bayou is 18,000 years old, and this has been happening for a very long time. This natural tendency to slump is one reason why we think attempting to engineer these banks as proposed by the $6 million Memorial Park Demonstration Project won’t work. It’s also the reason why we think building and repeatedly repairing sidewalks at the bayou’s edge is wasteful and foolish. The south-facing high bank of the Hogg Bird Sanctuary collapsed during the Memorial Day flood in 2015. Now self-restored. Photo on August 4, 2016. 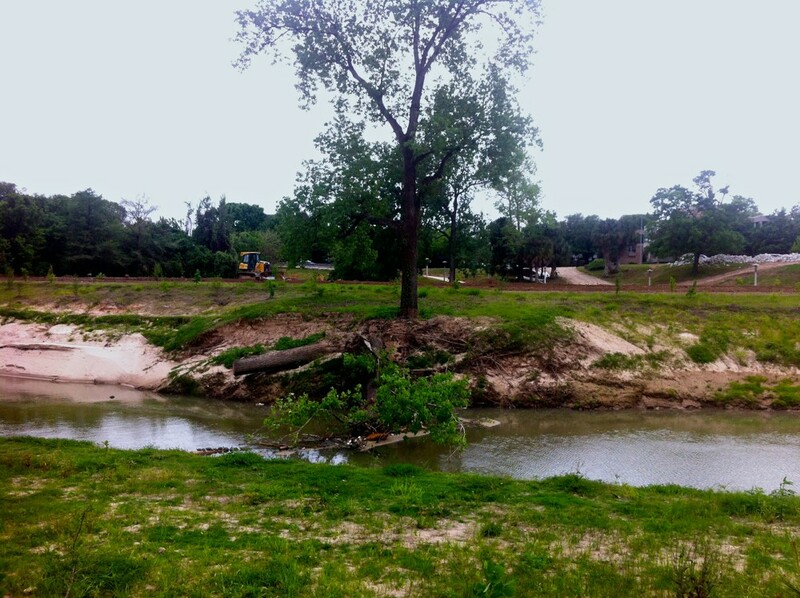 It’s a pointless, wasteful, ill-conceived, and maybe illegal project to rip up and raze trees and plants and wildlife habitat, dig up the banks, plug up tributaries, dredge and reroute the channel along one of the last natural stretches of Buffalo Bayou in Houston. This is a dreamy stretch of the river in the middle of the city, filled with beaver, otter, alligators, fish and flying creatures, and even edible plants. It flows for more than a mile past our great public Memorial Park, a natural detention area and significant geologic site that features very old high bluffs and sandstone formations. All of which would be obliterated. And after almost three years of adamant public opposition, the Harris County Flood Control District is still promoting the project, which will cost the taxpayers at least $4 million plus, not including future costs of maintenance and repair. It’s mystifying why they want to do this, why they think it would even work, why they don’t realize that the bayou would wash it away or that it would simply all slump away, as has happened in Buffalo Bayou Park downstream, where taxpayers are footing the ever-mounting bill for constantly repairing the banks dug up and stripped of trees and vegetation by Flood Control. Do They Not Have More Urgent Problems? Surely, the flood control district has more urgent problems that require our hard-earned tax money. Harris County is one of the most flooded places in the country. And this project, billed as a “stabilization” and “bank restoration” program, will do nothing to address flooding and could even make it worse. 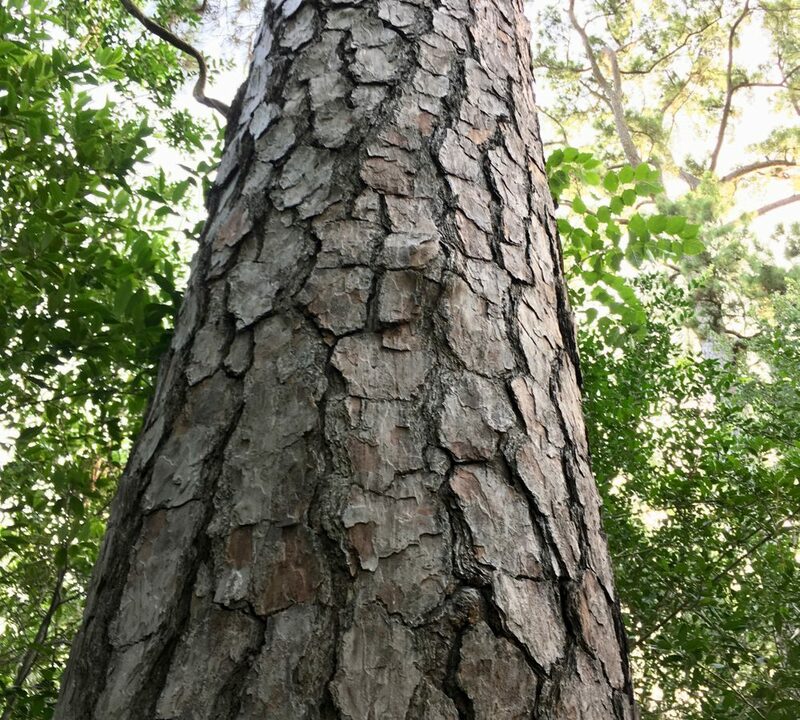 The county should focus on the hundreds of miles of channelized bayous and streams unwisely covered in now-aging concrete that should be restored to something more natural and beneficial. The project, called the Memorial Park Demonstration Project, was first proposed in 2010 by the Bayou Preservation Association under then board chair, Kevin Shanley, landscape architect and principal with SWA Group, the firm responsible for the ugly, obtrusive bridges, collapsing sidewalks, poorly-functioning dog park and non-functioning faux Hill Country fountain and stream in Buffalo Bayou Park. 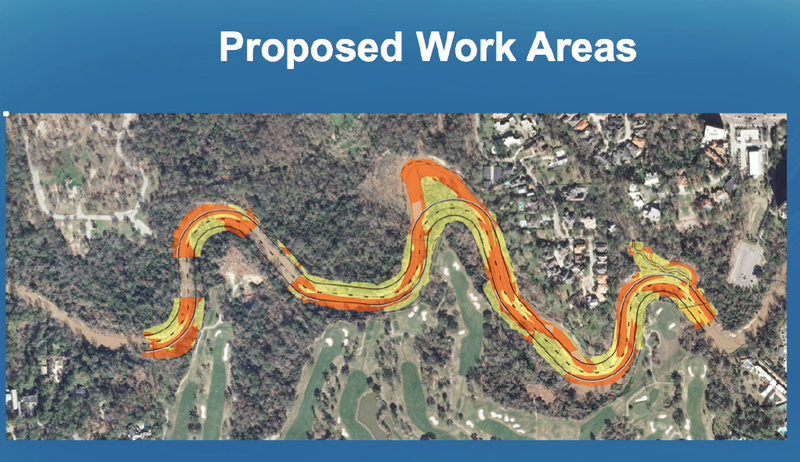 This map prepared by the Harris County Flood Control District shows the areas to be excavated (yellow) and filled (orange) in the proposed Memorial Park Demonstration Project. Note also the rerouting of the channel. Memorial Park and the Hogg Bird Sanctuary, including a tributary, are on the north, with houses in between. The entire south bank is River Oaks Country Club golf course. Can An Urban Stream Restore Itself? 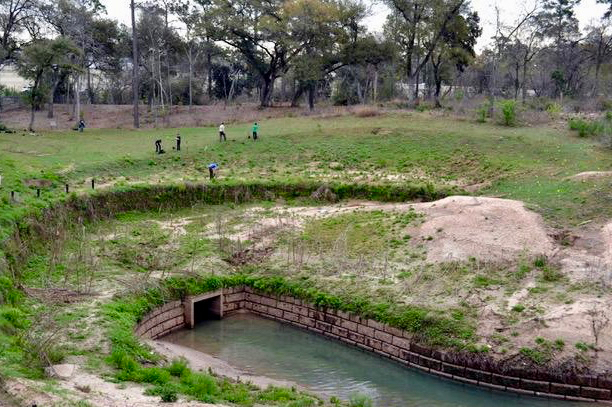 This article is adapted from a presentation made at the Southwest Stream Restoration Conference in San Antonio, Texas, on June 2, 2016. Save Buffalo Bayou is a non-profit organization founded two years ago to fight a public project described as a “restoration” project on one of the last natural stretches of Buffalo Bayou as it flows through the middle of Houston, past 1,500-acre Memorial Park and another 15-acre public nature preserve, the Hogg Bird Sanctuary. Since then our organization has expanded into broader, related issues. But today’s topic is restoration. 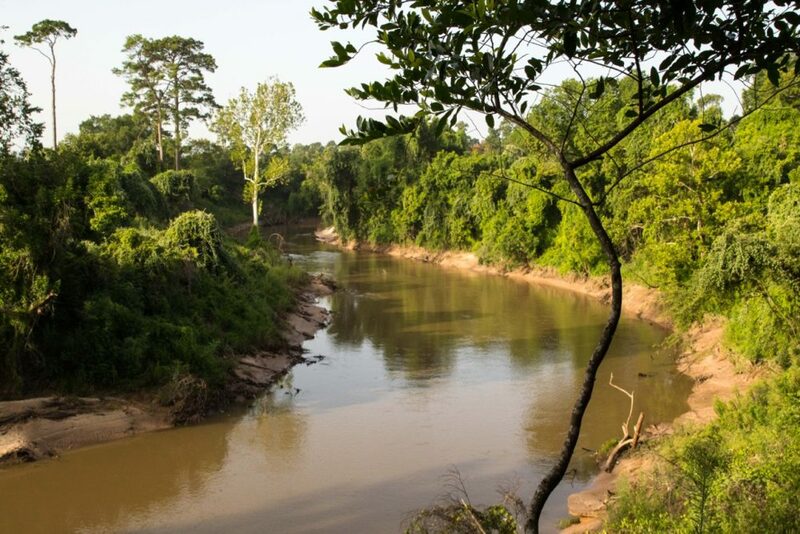 Here are some of the most common responses I would get when I would say that this mile-long plus stretch of the bayou is natural, along with what were some of the most common defenses of the project. The river’s not natural because the river changes. It’s not natural because it’s been altered by high runoff from urbanization. It has terrible erosion problems. Look at those steep high banks! It’s terribly eroded. Look at those sandy banks! It’s eroding terribly. Sediment from the banks in Memorial Park washes up on the sidewalks of Buffalo Bayou Park we built downstream in the floodway right next to the river. And of course the big one: the river needs to be stabilized because it moves around. Then there’s the argument, both implied and explicit, that prompted me to select this topic for presentation today: an urban stream cannot restore itself. All of those statements, of course, indicate a profound misconception about nature, about how a river works and how rivers benefit us. A river is a living symbol of change. A living system. A dynamic process of nature that works for our benefit. Even the simple grains of sand work on our behalf to cleanse the water.